The Scanpan Classic 2 piece nonstick fry pan set is designed for small to medium sized portion cooking. This fry pan set from Scanpan is made for high heat cooking. Use it to sear a few chicken breasts or prepare an omelet This non-stick skillet from Scanpan also is great for sauteing veggies or for New Orleans-style blacked fish. Sloped slides make it easy for you to get a spatula under your food to flip or remove it, without making a mess. Scanpan pots and pans are made with 100% recycled aluminum and crafted in Denmark. Scanpan Classic cookware will stand up to years of cooking. Use the entire cooking surface as Scanpan is made to have even heat and no "hot spots." Feel good that you're buying an environmentally friendly pan, made from 100% recycled aluminum. 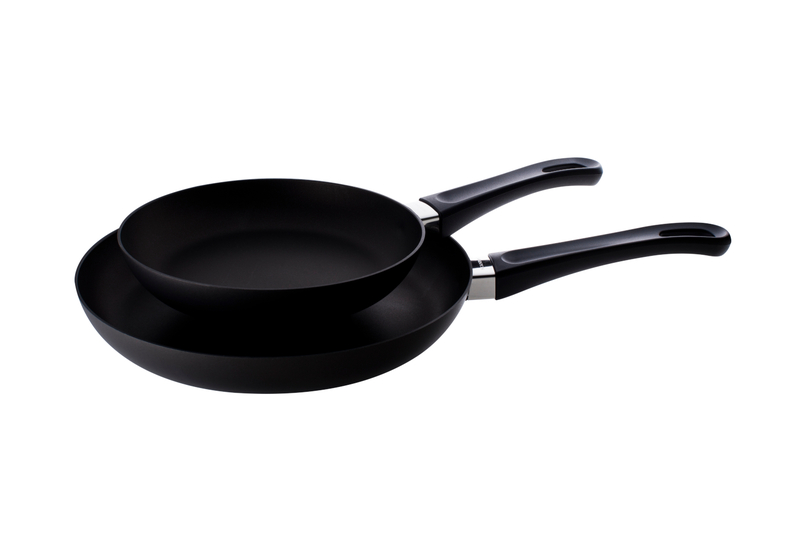 Danish-made Scanpan nonstick cookware is PFOA free! 8 inch weighs 1 lb. 7 oz. and 10.25 inch weights 2 lb. 4 oz. Food does not get trapped anywhere on cooking surfaces, since handles are attached to pans without screws or rivets. Unique design of handle ensures sturdiness. Handles guaranteed to remained affixed!